Honeypie’s Recipes thanks all the brave men and women and their families who serve or have served our country by offering a Veteran’s Day Apple Pie with Crumb Topping recipe. Interestingly, apples are not native to the Americas; they were brought here from Europe. Apple pie became a symbol of prosperity and national pride in the 19th and 20th centuries. 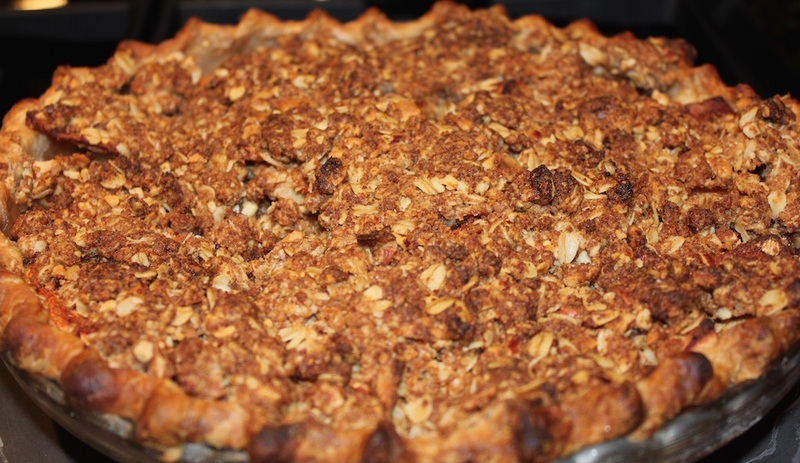 Hence the expression “As American as apple pie.” We took the liberty of making a version from the Dutch, which uses a crumb topping instead of a double crust. 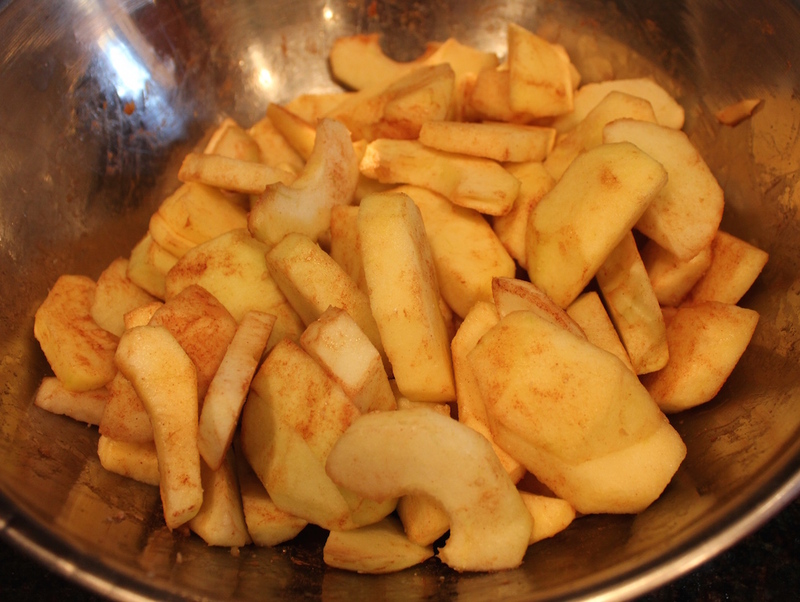 Traditional accompaniments for apple pie are whipped cream, ice cream, or thin slices of sharp Cheddar cheese. Dump the flour, sugar, cinnamon and salt into a large bowl. Cut the butter in half lengthwise and then into 8 slices. Toss these into the flour and coat the individual pieces well. Cut the butter with a pastry blender until the butter is in tiny pieces about the size of a pea. Use the butter wrapper to grease the inside of the pie dish. Measure 1/4 cup water, add vanilla extract, and drizzle over the flour. Toss gently with your fingers to incorporate the moisture. Form a small clump of dough. If it crumbles easily, add another tablespoon of water and toss. Repeat the crumble test. Add another teaspoon or two of cold water if it’s still dry and repeat the crumble test. 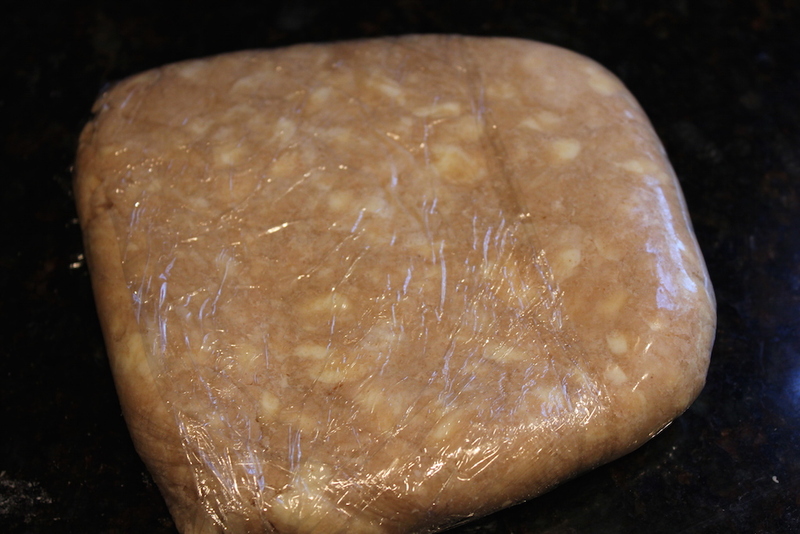 Once the dough holds together, push it all together into a mound and place on a piece of plastic wrap. Wrap securely and push down to form a round disc. Refrigerate for at least 30 minutes to hydrate the flour. 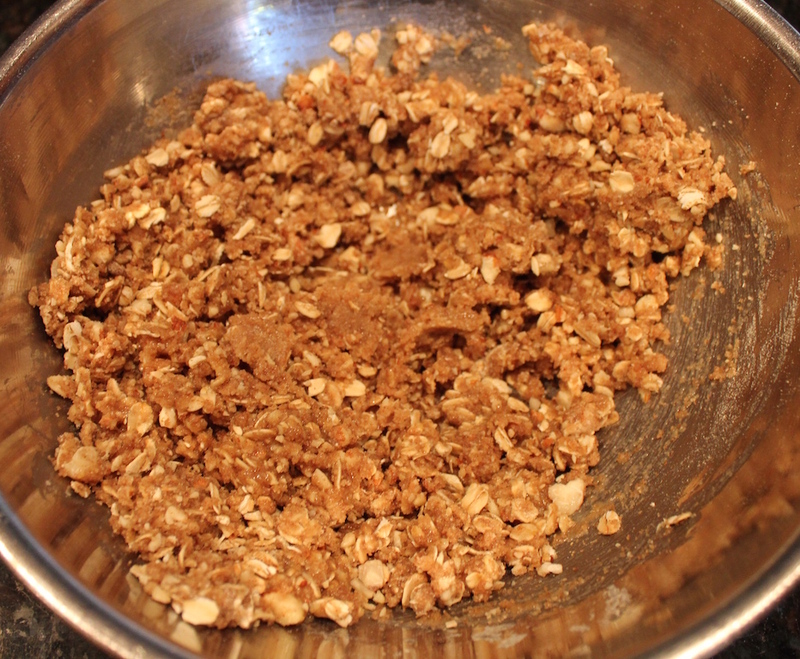 Place the sugar and walnuts in the base of a food processor and pulse until the nuts are mealy. Add the flour, oat, cinnamon and salt and pulse five-six times. Dump the crumble mixture into a medium-sized mixing bowl. Pour the melted butter onto the crumble mixture and stir until combined. *Note: I used two each Granny Smith, Macoun, Honeycrisp and Golden Delicious; each has a different sweetness or tartness and soft or firm texture, which makes a complex pie. Peel and core the apples and cut into 1/2-inch slices lengthwise. Sprinkle with cinnamon and salt; toss to combine. 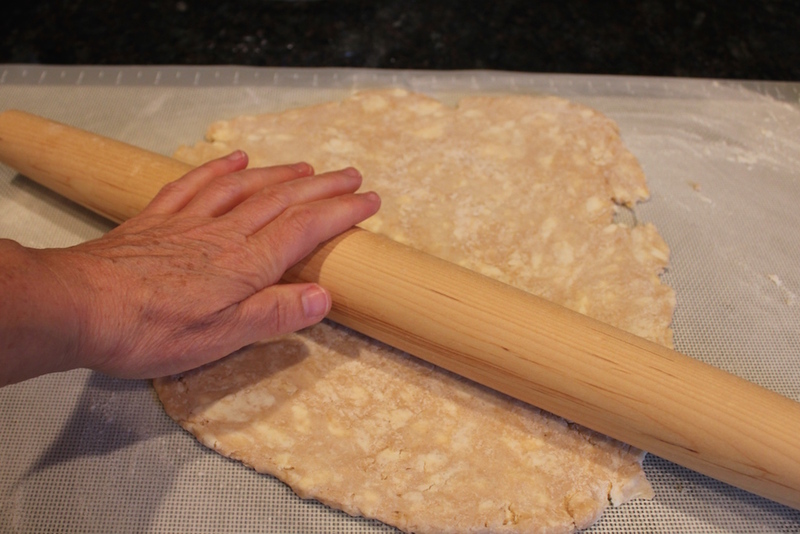 Lightly flour a rolling surface, the rolling pin and both sides of the pastry dough. Roll the dough out from the middle; turn, roll from the middle. If the dough begins to stick, lift and lightly sprinkle more flour on the rolling surface, rolling pin and pastry dough. Continue rolling, turning and dusting as needed until the dough is roughly 14-inches round. 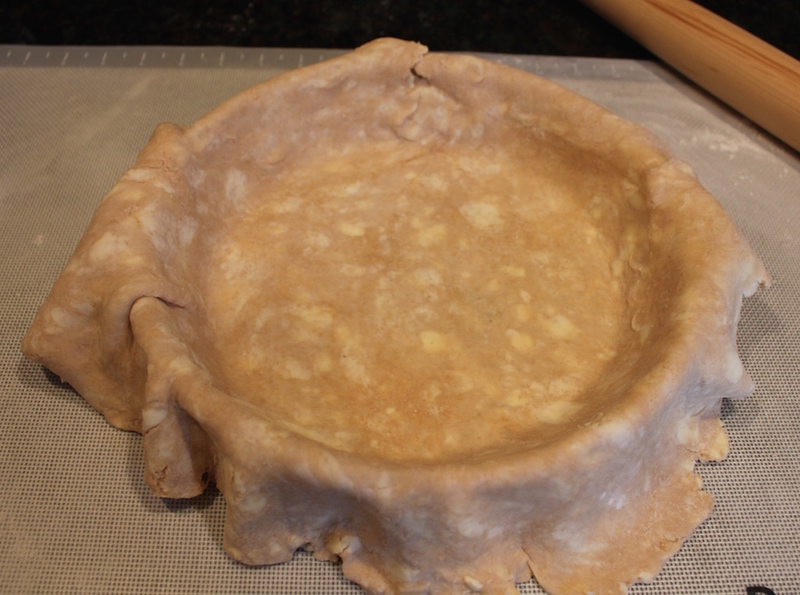 Roll out the pie crust (see our post/video) around the rolling pin and drape evenly across the pie dish. Lift each side and tuck the pastry down the sides of the pie dish. Cut the edge of the dough around the pie dish leaving a one-inch overlap. Fold the overlap under and then crimp. 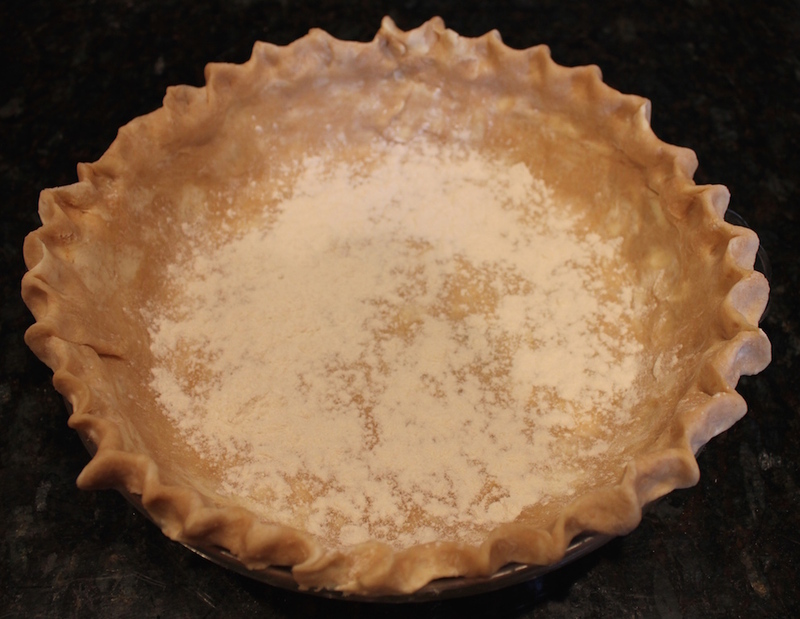 Sprinkle the bottom of the pie dish with one tablespoon all-purpose flour. 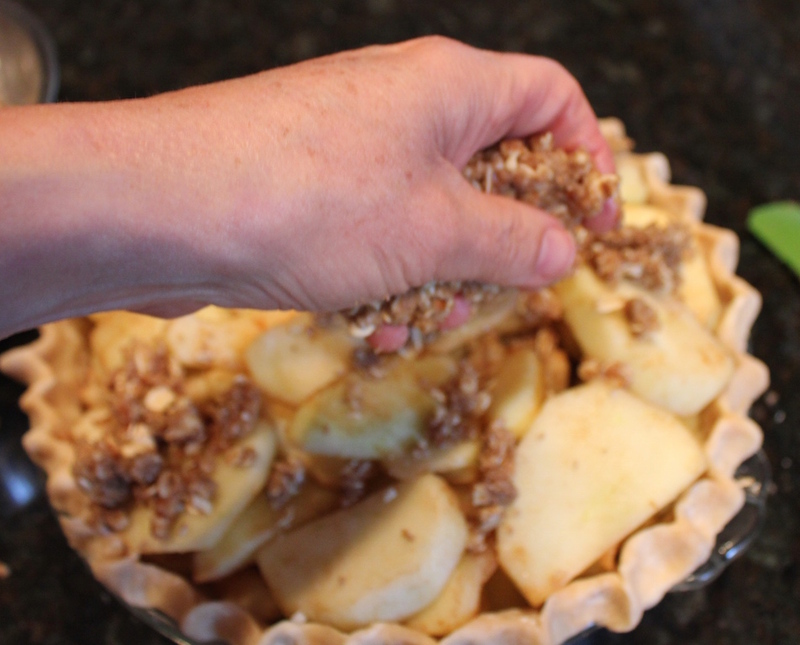 Slide the apple mixture into the dough-lined pie dish. Strew the crumble over the top. Bake in preheated oven for 30 minutes, then reduce the heat to 350ºF and continue cooking until the apples are fork tender and juices are bubbling, about 45 minutes; the pie is done when the apples are easily pierced with a knife. Make this delicious apple pie with crumb topping with a variety of apples, such as McIntosh, Granny Smith, Golden Delicious or McCoun. Serve with whipped cream, ice cream or slices of Cheddar cheese. Dump the flour, sugar, cinnamon and salt in a large bowl. Cut the butter in half lengthwise and then into 8 slices. Toss these into the flour and coat the individual pieces well. Cut the butter with a pastry blender until the butter is in tiny pieces about the size of a pea. Pour the vanilla into a measuring cup and add four ounces of cold water. Drizzle over the flour. Toss gently with your fingers to incorporate the moisture. Form a small clump of dough. If it crumbles easily, add another tablespoon of cold water and toss. Form another small clump and repeat the crumble test. Add another teaspoon or two of cold water and repeat the crumble test. Once the dough holds together, it should not be wet, push it all together into a mound and place on a piece of plastic wrap. Wrap securely and push down to form a round disc. Refrigerate for at least 30 minutes to hydrate the flour. Peel and core the apples and cut into 1/2- to 3/4-inch slices lengthwise. Sprinkle with cinnamon and salt; toss to combine. Put the sugar and walnuts in the base of a food processor and pulse until the nuts are mealy. Add the flour, oat, cinnamon and salt and pulse five-six times. Dump the crumble mixture into a medium-sized mixing bowl. Pour the melted butter onto the crumble mixture and stir until combined. Lightly flour a rolling surface, the rolling pin and both sides of the pastry dough. Roll the dough out from the middle; turn, roll from the middle. If the dough begins to stick, lift and lightly sprinkle more flour on the rolling surface, rolling pin and pastry dough. Continue rolling, turning and dusting as needed until the dough is roughly 14-inches round. Roll the dough around the rolling pin and drape evenly across the pie dish. Lift each side and tuck the pastry down the sides of the pie dish. Cut the edge of the dough around the pie dish leaving a one-inch overlap.